The Great Barrington Farmers Market makes a distinct effort to bring fresh local food to all. We accept SNAP and HIP, WIC and Senior market coupons. Please visit us at the market managers table and we will be happy to help you use your benefits to purchase fresh local food for you and your family. For More information on Qualifying for nutrition assistance please use the following links. SNAP -Generous support from our sponsors The Berkshire COOP and Jane Iredale Cosmetics allows the Market to offer SNAP matching benefits helping you to stretch your dollar at the market. We will double your SNAP up to $25 per market. 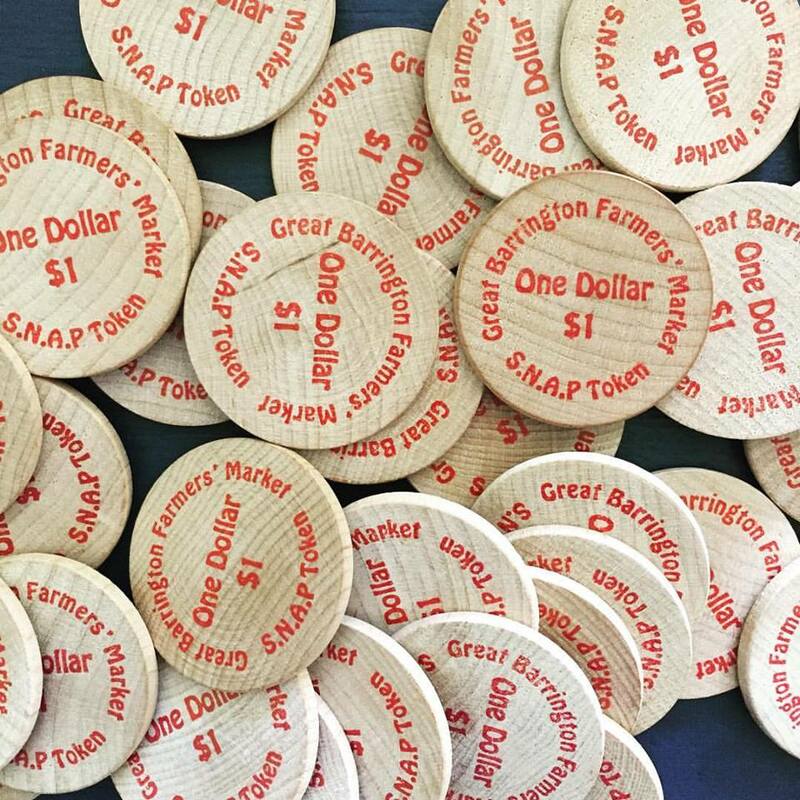 SNAP is distributed as wooden tokens that can be redeemed for qualifying goods at the market. WIC- WIC is a nutrition program that provides nutrition and health education, healthy food, breastfeeding support and other services free of charge to Massachusetts families who qualify. Senior Coupons- These coupons are distributed to low-income elders in the summer. Massachusetts also serves low-income seniors who are unable to use the coupons due to access limitations by facilitating bulk purchasing of fruits and vegetables that are distributed to home bound elders with their regularly scheduled meals deliveries, or distributed at on-site meal programs. HIP-The Healthy Incentives Program (HIP) matches your SNAP purchases of local fruits and vegetables when shopping at farmers markets, farm stands, mobile markets and Community Supported Agriculture (CSA) farm share programs. Spend your SNAP dollars on farm-fresh fruits and vegetables at participating HIP retailers and have the amount of your purchase instantly added back to your EBT card!